Now let’s get into the program spreadsheets! 3 nSuns All in One: 4, 5, 6, day templates with squat and deadlift specific variations. 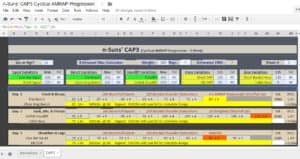 This insane spreadsheet combined 4 different versions (4 day, 5 day, 6 day squat focus, and 6 day deadlift focus) with automated tracking. It has a detailed HELP tab that describes how to use the spreadsheet. It even maintains a log of your training activity and has a macro calculator to boot. If you don’t know which spreadsheet you want, this is probably the one. The original that started it all. This took Jim Wendler’s 5/3/1 and incorporated weekly progression,whereas the initial Wendler 5/3/1 program planned for monthly progression. While many advanced lifters are not able to progress on a linear basis, this is a great choice for beginners and intermediates looking to pack on strength and practice the major compound lifts. 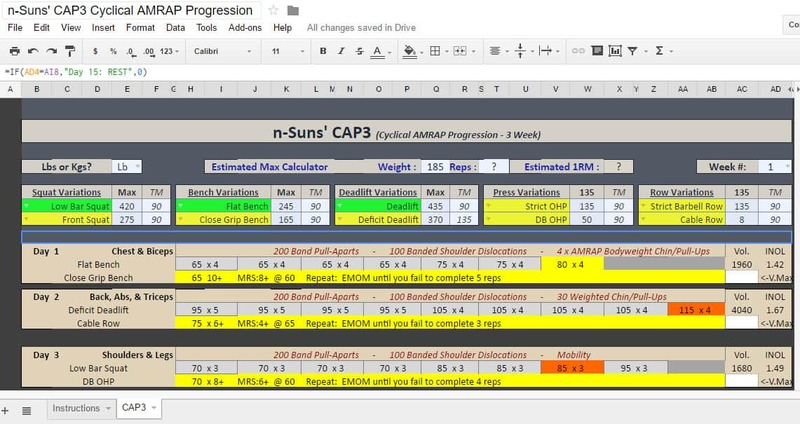 Initially the spreadsheet advised that 1 rep sets add 5 lbs onto the training max, which was incorrect. The spreadsheet below reflect this update. nSuns All in One: 4, 5, 6, day templates with squat and deadlift specific variations. Plus, you can customize and track your weak point so help customize the program base d on your individual areas for improvement. Complete with crystal clear instructions, n-Suns collection’s of 5/3/1 mutations that seems super easy to read along with and follow. In fact, all you need to to is pick your 1RM for the big 4, enter your bodyweight, and you’ll be gaining strength, getting bigger, and setting PRs before you know it. Even though the traditional 5/3/1/ BBB model trains each of the major compounds lift once per week with a ton of muscle building accessories, this variation has the athlete deadliting twice per week in addition to a sumo deadlift day, leading to thee deadlifting sessions per week. While the traditional 5/3/1/ BBB model trains each of the major compounds lift once per week with a ton of muscle building accessories, this variation has the athlete competition squatting twice per week and doing a near-variant one additional day for a total of three squatting todays. Looking to improve you squat? This may be just what the doctor ordered! Here is a collection of reviews from different athletes that have run NSuns programs.